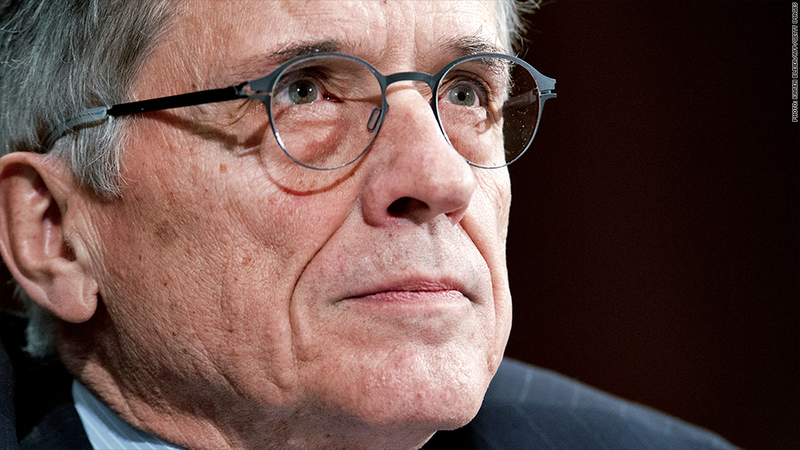 FCC chairman Tom Wheeler, a former cable industry lobbyist. Federal regulators are poised to lay down new rules of the road for how Americans access the Internet. Federal Communications Commission chairman Tom Wheeler proposed new regulations Thursday that would allow Internet service providers like Comcast (CMCSA) and Verizon (VZ) to strike deals with individual websites and services, giving them priority access -- a so-called "fast lane" -- to customers. The FCC will vote on the proposal on May 15 before putting it out for public comment. How would the fast lane work? It's not 100% clear yet. Hypothetically, you could imagine Amazon (AMZN) striking a deal with Cablevision (CVC) to make its results load twice as fast on Black Friday. Streaming media services like Spotify might want to pay broadband providers for priority access to make sure their users aren't held up by endless buffering. Different companies will have different approaches, and it's up to the FCC to decide what's reasonable and what isn't. What do the rules cover? The FCC's planned rules relate specifically to broadband, which is used for most home Internet connections. They won't cover the mobile Web, which is much more lightly regulated. The FCC rules also won't cover deals like the one reached earlier this year between Netflix and Comcast, in which the online video company reluctantly agreed to pay for a direct connection to Comcast's network to boost lagging streaming speeds. That's because the proposal only relates to the so-called "last mile" of broadband networks, where they connect directly to the homes of customers. It doesn't relate to connections between the many networks that make up the broader Internet. Why allow a fast lane? In a conference call with reporters Thursday, senior FCC officials said preserving innovation and competition were their core concerns. The proposal follows a January court decision that struck down the FCC's previous "net neutrality" rules, which barred Internet service providers from blocking or "unreasonably discriminating" against online content. The regulator has since been working to craft new rules that will pass legal muster. But the FCC said there were a number of possible instances in which prioritized connections could be helpful to some consumers without harming the broader marketplace, citing the example of remote heart rate monitoring for medical patients. It could be. With broadband providers collecting revenue from both home subscribers and content providers, it's possible that monthly cable bills could drop in some places should the proposal go into effect. Wheeler also noted in a blog post Thursday that the proposal includes several protections to ensure companies don't abuse the fast lane. Any agreement between a broadband provider and a content company will be invalidated if the commission finds it's not "commercially reasonable." Wheeler claims the "commercially reasonable" test will ensure that consumers don't face price hikes as a result of deals between content providers and broadband companies. The FCC, he added, will invalidate any deals that create "harm to competition and consumers stemming from abusive market activity," though it's still not clear how that standard will be implemented in practice. The proposal would also ban the blocking of lawful content and would require a "baseline level of service" for all sites. "There are many possible priority arrangements that give consumers more broadband services and don't harm competition," said Brent Skorup, a tech policy expert with the Mercatus Center at George Mason University. Given the limited options most Americans have for high-speed Internet, net neutrality supporters aren't so optimistic. They worry that if companies like Netflix (NFLX) are forced to pay up to ensure adequate speeds, those costs will be passed on to consumers. There's also the fear that start-ups will be disadvantaged against larger, deep-pocketed rivals, and that the prospect of fast-lane revenue will create an incentive for ISPs to allow congestion to build. "The proposed approach is the fastest lane to punish consumers and Internet innovators," Netflix said. Tim Wu, a Columbia Law School professor who coined the term "net neutrality," says the proposal "will profoundly change the Internet as a platform for free speech and small-scale innovation." "We take it for granted that bloggers, start-ups, or nonprofits on an open Internet reach their audiences roughly the same way as everyone else," Wu wrote in a blog post for The New Yorker on Thursday. "Now they won't. They'll be behind in the queue, watching as companies that can pay tolls to the cable companies speed ahead." Activists are already preparing to fight the proposal, with some calling for a wave of protest on the issue similar to that which derailed the controversial Stop Online Piracy Act back in 2012. The FCC doesn't have a great record on net neutrality issues, and vague, subjective standards about what's "reasonable," won't likely help its cause. Some believe the FCC could have imposed stricter regulations on broadband providers by treating them more like phone companies. That move would surely meet resistance from the industry's well-funded lobbyists, of which Wheeler was previously one. Yet despite weak regulation in years past, consumers haven't yet faced anything like the nightmare scenario some activists are predicting. It's also worth noting that consumer Internet use is shifting rapidly to apps mobile devices, so whatever regulations the FCC lays down may not seem as consequential in a few years' time as they do now.